MISSISSIPPI MAN (Dan Trimmer) Tetraploid ((Ed Brown x Tetra Connie Burton) X (Tetra Grace Pierce)) 28” Early Re. Ev. 6 ½” From the first day this plant bloomed I knew it was an introduction. 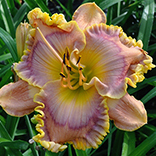 When Earl Watts asked me to attach a prefix name of “MISSISSIPPI” to one of my 2007 introductions I wanted to select the cultivar that I thought would be admired by the largest daylily audience possible. 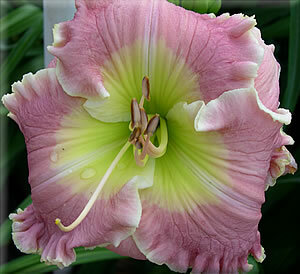 MISSISSIPPI MAN’S 6 ½” deeply ruffled bloom is very large displaying strikingly clear lavender pink petal color above a huge chartreuse throat surrounded by a white ruffled edge. MISSISSIPPI MAN is nicely branched with three laterals and about 28 buds per scape. I’ve crossed both ways with MISSISSIPPI MAN as I want to continue on with taller scapes and very large flowers in my pink, lavender and dark lines. I’ve very proud of this flower!